After two team-ups with the seditious creative Nicolas Winding Refn, the writer and director behind the cult classic “Drive” and the panned “Only God Forgives”, heartthrob star Ryan Gosling graduated from the camera’s muse to its master. Or at least that was probably his hope stepping into the director’s chair for the first time and using his own screenplay. But if critical opinion is something you value, it appears the film criticism press has called his bluff. “Lost River”, his debut feature film, has had every insult in the book thrown at it. At best, they say, it’s an all right imitation of other filmmaker’s art; a hollow, meandering, lifeless work without an original idea, thought, or creative idea in its pretentious innards. Even generous reviews label it the equivalent of a derivative arthouse stir-fry of Refn, David Lynch, Terrence Malick, and Dario Argento. On many levels I agree. Look to a mid-film sequence with Ben Mendelsohn unsubtly models Dean Stockwell’s famous lip-syncing performance of Roy Orbison’s In Dreams, the iconic scene from the landmark nightmarish noir “Blue Velvet”. A colleague correctly pointed out the color pallette steals the instagram look of Spring Breakers. 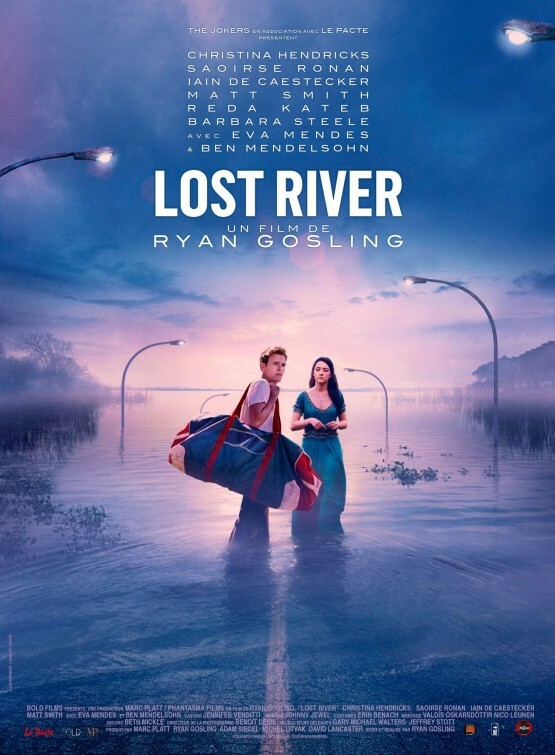 The volume on Gosling’s references are so loud they distract to the point of deafening what’s new and authentic, a probable reason why “River” has been hailed as a catastrophe by some. The plot is a Grimm’s Fairy Tale in the crumbling city of Detroit, where empty houses span for miles. A single mother (Christina Hendricks) is raising two kids: Gosling lookalike played by Iain De Caestecker (“Agents of S.H.I.E.L.D.” ) as well as a baby, and they live in debt and fear losing their house. A predictably grimy banker, Dave (Ben Mendelsohn), offers the mother a job at a nightclub with implications of sexual exploitation. The elder child might’ve been played by Gosling were he 10 years younger, and, like all the characters, he has an unworldly name that sounds like southern legend brought to life: Bones. Hendricks is Billy, Doctor Who’s Matt Smith plays a local gangster named Bully, and Bones lusts on his gorgeous neighbor named Rat (Saoirse Ronan). She owns a rat. The overall thrust of the story is broad, with a group of helpless kids trying to make it in a world that doesn’t want to let them. They have an out, and whether it’s urban myth (though the whole film is fashioned to seem like one) or dreamy logic, Bones is told if you retrieve a piece from a sunken city it’ll break the spell on their town and they can finally escape it. Gosling claims to have referenced “The Goonies” more than something like “The Tree of Life”, but the resemblance to these other movies, intentional or not, is constant and clear. It’s an objective, categorical similarity. “Lost River” lifts images, editing, plotting, and just about anything you can think of from other movies. It’s derivative, but its imitations are anything but numbing. 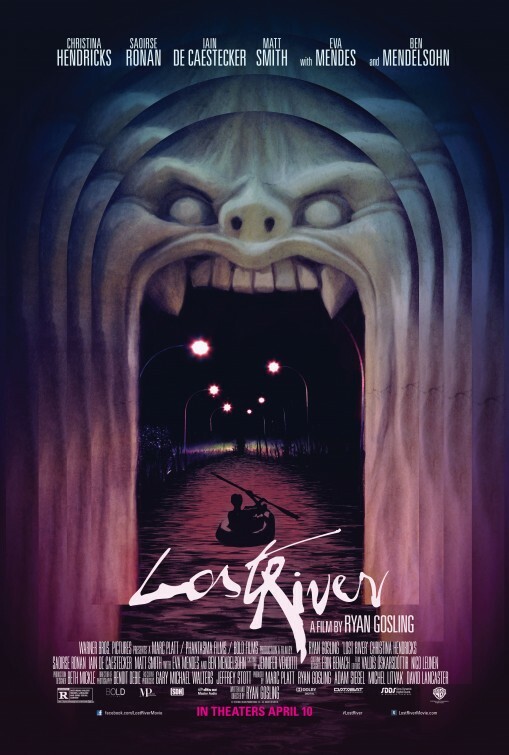 I say with pleasure that “Lost River” is the opposite of boring, and that there’s a palpable excitement to experience a filmmaker clearly excited by his own material – whatever flaws it may contain. So easily could the messy impressionistic structure have been tedious, but what appears to be raw talent refrains that from becoming true. “Lost River” reveals an over-eager director churning milk into butter, a talent with enough promise that I get hungry for the future. That is to say, it’s not successful on its own merits so much as 90 minutes of all the things Gosling has proven he can do right. If his first foray into film is only a shadow, it’s a shadow with personality. The ambition is impressive, and I admire how Gosling ignored easy paths. Ex-Chris Nolan director of photography Wally Pfister made the same move last year with Transcendence, a dud of the highest order. But where that was an awkward limp of a thing, “Lost River” is provocative. In a set that resembles an art installation that might be at the MET or MCA, women lock themselves into a hard plastic cage that looks like a curvaceous woman. She becomes a literal and figurative victim of the male gaze, physically safe yet still objectified and humiliated. It’s the most artistically accomplished element of the whole feature, conceptually visceral and visually audacious. Were the film comprised of set pieces along these lines, it would’ve been a striking first feature, but in refusing to resolve past the realm of art house pastiche, the result is superficial viewing. I say with satisfaction this is 100% what Gosling seems to have wanted to make. Many of his publicized fetishes have made their way into his debut’s color saturated images. He’s spoken of an interest in the abnormal as well as the supernatural, the whispered oddities of daily life that some call ghosts. I suspect he might be a fan of “American Horror Story”. The same visceral abuse he experienced in Refn’s very own “Valhalla Rising”—where bloodsport violence unleashed an immediate loud audience reaction that mesmerized him to the point of wanting to collaborate with the movie’s director—manifests in a hellish nightclub (literally, with a demon-mouthed door), where women pick their bodies apart with surgical precision and gore. The extended cast delivers fine work and contribute clashing personalities that make them memorable. Frankly, flawed and empty as it may be, I found a lot to like.